Start by making the soup: heat the olive oil in a large heavy saucepan over medium heat. Add the onion and red pepper flakes and cook, stirring occasionally, until the onion is tender. Add the tomatoes, breaking them with the spoon, followed by the sugar, thyme and the water and cook, stirring occasionally, for 30 minutes. Add the basil, season lightly with salt and pepper and let cool briefly before pureeing the soup in a food processor or blender, in batches if necessary. Pass the soup through a fine-mesh strainer, pressing on the solids with a ladle (Barbara Lynch’s advice: “save the pulp – it’s delicious on crostini or baked eggplant”). Keep the soup on low heat while you make the grilled cheese. For the grilled cheese: preheat the oven to 200°C/400°F. Have ready two large baking sheets so one can nestle into the other. Line one of them with baking paper. With a serrated knife, cut the bread into 6mm (¼ in) slices (if necessary, place the bread in the freezer for a while to make slicing easier). Place the slices on the prepared baking sheet. Melt the butter in a small saucepan and add the oregano. Brush half the bread slices with the butter and place the buttered side down, in contact with the baking paper. Divide the cheese evenly among the buttered bread slices. Cover the cheese with the remaining bread slices and brush the top with the butter. Place a large piece of baking paper on top of the sandwiches and stack the second baking sheet on top of the paper. Bake until the bread is golden and crisp, 15 minutes or so. Remove from the oven and peel off the paper. Remove the sandwiches from the baking paper. 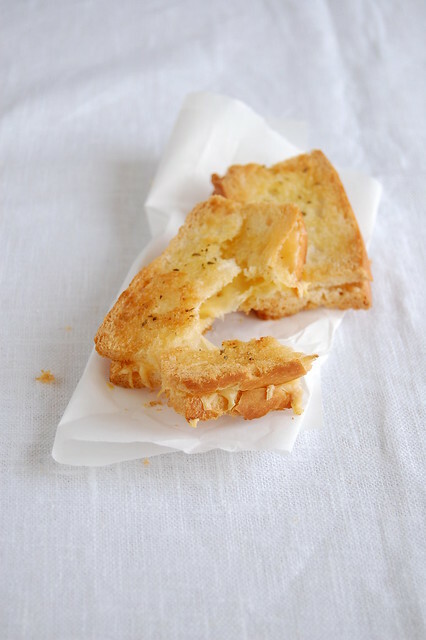 Ladle the soup into bowls, cover with some crème fraîche and a sprinkle of oregano and serve it with the grilled cheese. 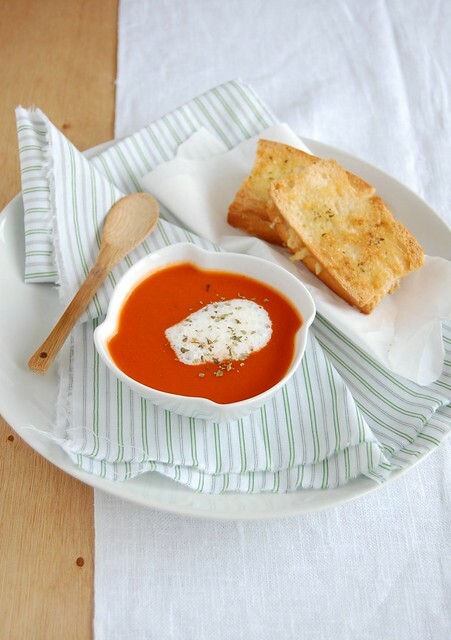 Omg, super comforting soup, loved those crispy grilled cheese..
oh do i have to give you props on this one. love love love it! I love this pairing on a cold evening! Yum!